The rave in Japan is all about yakitori (skewers). And it’s not your typical beef, mushroom and bell pepper skewers. It’s more like heart and liver skewers! Don’t be scared. If you’re less adventurous, there’s also the usual chicken, shrimp and veggie options. So, a group of friends and I got together to try Sumika Grill in Los Gatos for their… you guessed it! Yakitori! Sumika Grill is very traditional Japanese. They have pictures of sumo wrestlers on the wall and the master Japanese chefs are working the grills at the center of the restaurant where the kitchen is situated. The caveat with yakitori is that portions are small, so it takes a lot to get full. The skewers start off at $3.50 each, but you’d be surprised at how much it adds up. For a table of 8, we each paid about $30. Veggie Tempura – I didn’t get much of this, but I do remember it not having much of a crispy skin. The tempura was swimming in a light sauce, making the veggies soggy. I wouldn’t order this a 2nd time around. Chicken Karage – I’m a huge fan of chicken karage, Japanese fried chicken. Some how, Japanese restaurants are able to make fried chicken that’s incredibly tender and juicy. The karage at Sumika Grill was exceptionally mouth-watering. The pieces are larger than your typical karage, but I won’t complain about the size. Fried Garlic – This, on the other hand, was amazing! Fried garlic – who wouldn’t love that? The cloves were so soft, creamy and sweet. Not a hint of sharpness from the garlic in sight. The bulb also came with a creamy and tart sauce. I have no idea what’s in it other than Kewpi (Japanese mayo), but it’s good. Yakitori – We had an array of yakitori – chicken thighs, shitake mushrooms, scallops, hearts, livers, shrimp, bacon-wrapped asparagus and bacon-wrapped enoki mushrooms. 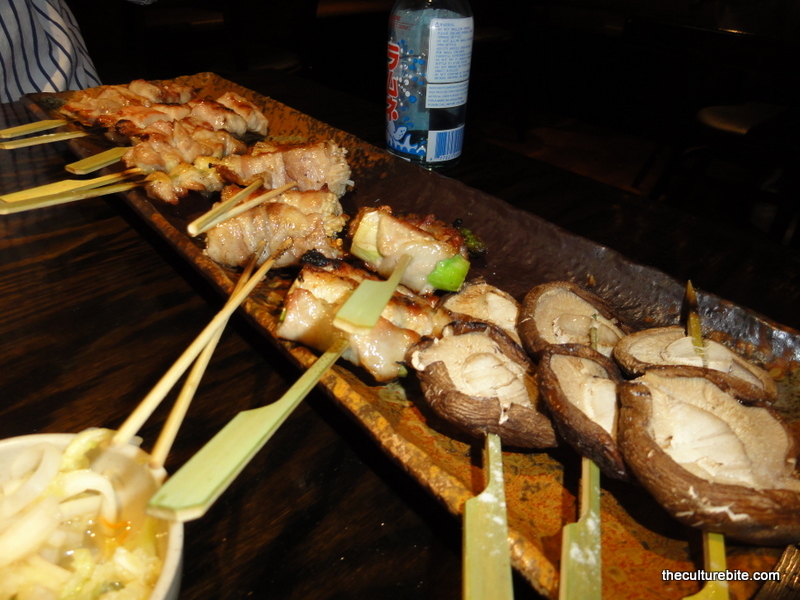 All were very good, but I liked the enoki mushrooms wrapped in bacon the most. The saltiness from the bacon and the juices from the mushrooms made for one tasty skewer. Grilled Rice – I was so full at this point, but I had to try the grilled rice. These rice patties are super crispy on the outside and is packed with sticky soft rice mixed with sweet seaweed. A little sweet and a little salty. So good. I could eat these and the fried garlic all day. I am a fan of this place and I’d definitely come back again. A well deserved 4 stars! By the way, I have not tried their famous sister restaurant, Orenchi Ramen in Santa Clara, but I’ve heard it is the best ramen in the Bay Area.